With a 500-word limit on each Digital Trends column, it can be a challenge to deliver some interesting content while not getting too “techie” and talking over people’s heads. Last week, I ran out of room to write everything I wanted to say about the power of QuickBooks Pro for small business. Part two of this series focuses on more QuickBooks Pro features that all small business owners should know about. 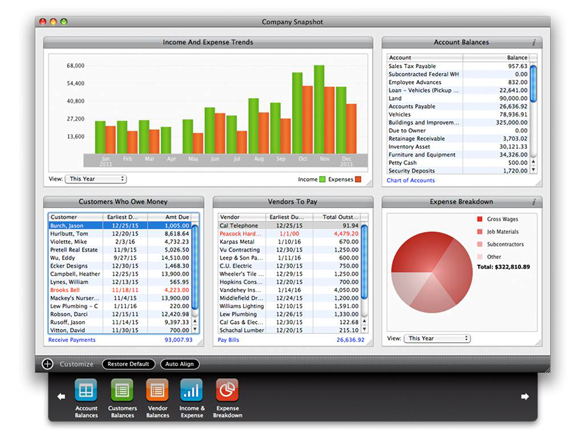 In the 2011 version of QuickBooks Pro, a new feature called “Snapshots” was introduced. Snapshots is a fast, flexible way to manage the health of your business by looking at your income, expenses, profit/loss trends, and more in one location. Starting on the icon bar in QuickBooks, you can launch Snapshots and you will see a widgetized abundance of information. Each widget breaks down one fundamental part of your business in more detail. Crucial statistics such as income and expense trends, current account balances, and accounts payable are immediately available. When you find something missing for your business needs, there are also a handful of additional content widgets you can easily add to your Snapshots page. Furthermore, because these are widgets, they can be arranged in any way you see fit. Additional features of the Snapshots page come from two other tabs at the top of the window. If you’re dealing with customer payments, you can start by clicking the “Payments” tab and view your recent transactions, jump immediately to payment reports, or see more charts that help give you a better payment breakdown. The “Customers” tab at the top of the window is used to analyze the details of your transactions for one customer at a time. This tab allows you to view a customer’s trends over time or just to see which items one customer has purchased most. I love the Customers tab as it helps me remember my previous interactions with a customer, and any other pertinent information I need, before I go forward with setting up a new sale. As a result, I’m a more informed business owner and am able to provide better service and insight to my customers. Lastly, one of the great features of the Snapshots page is that you can drill down on any transaction, graph, or widget listed to get more information. Typically in the form of a QuickReport, QuickBooks immediately allows you to dig into the dirty details as you need them. For finding mistakes or learning the “whys” behind any transaction, there’s no easier way to drill into the information as you need it. Stay tuned for next week’s final part of this QuickBooks series.